A new linear park, which is part of the state railroad museum expansion in Boulder City, is one step closer to happening as the city was recently awarded a grant to cover some of the costs. LGA This rendering showcases what is planned for the new linear park and railway trail in Boulder City that will become part of the Nevada State Railroad Museum. The $350,000 grant from the National Park Service’s Land and Water Conservation Fund will help pay for the planned expansion of the Nevada State Railroad Museum at 601 Yucca St., which will also include a new visitors center. “We’re essentially going to turn the museum inside out through the linear park,” said museum director Randy Hees. Larry Bender of the Boulder City Economic Vitality Commission said he learned about the grant and helped prepare the city’s application. He said the $350,000 is part of $1 million in federal money given to Nevada from the country’s gas, oil and timber revenue. “Construction of this park will not only serve our economic development needs as a tourist destination. It will add to the community’s quality of life by providing additional amenities that residents and visitors can enjoy,” said Boulder City Manager Al Noyola. Boulder City spokesperson Sue Manteris said the grant money will be used to help fund amenities for the park. At the May 8 City Council meeting, Bender, Hees and Nevada Division of Museums Division Administrator Peter Barton presented plans for the expansion and the linear park, which includes a railroad-themed playground, picnic areas and 7½ inch-gauge rideable model trains. The first phase of the museum expansion is the approximately $14.3 million new visitors center and parking lot, which is the state’s responsibility, according to Hees. 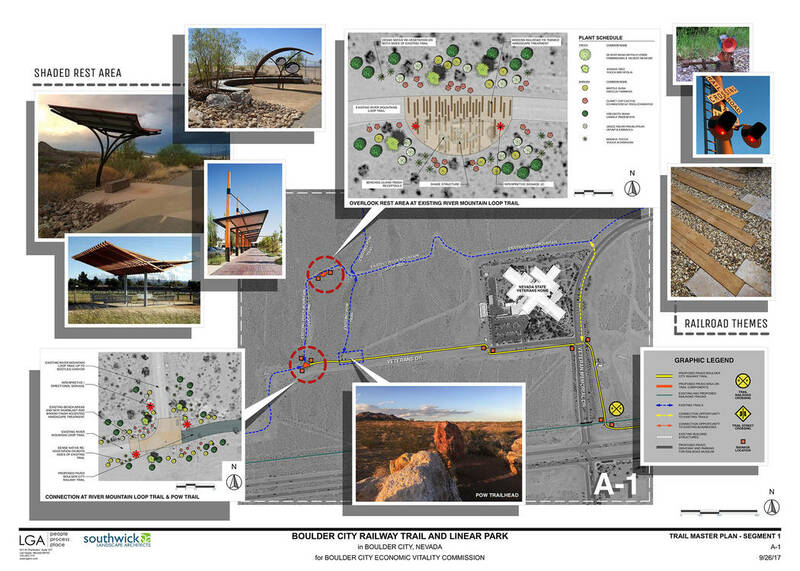 The second phase is the $10 million linear park, which will be paid for by Boulder City. According to Manteris, the city is “targeting private and public sources for funding” of phase two. Bender also said he is looking for more funding sources. With the expansion, Hees said, the museum’s core operations will move to the corner of Buchanan Boulevard and Boulder City Parkway. Between the new museum center and its current location on Yucca Street there will be different pieces of railroad equipment for people to interact with, as well as the linear park. “Trains are linear. … The idea was to create an environment where the public felt welcome to go from one end to the other to find the equipment that would be there,” he told council members. The linear park also includes a bike and pedestrian trail and will connect to the River Mountain Loop Trail, Bender said. Hees said officials expect to work on portions of the first two phases at the same time, but they are not sure what those pieces will be yet. Once those phases are complete, the museum will work on the third phase, which is the construction of two new display buildings for historic railroad pieces. According to Manteris, the Nevada State Railroad Museum is the most visited of Nevada’s seven museums with approximately 44,000 visitors a year.